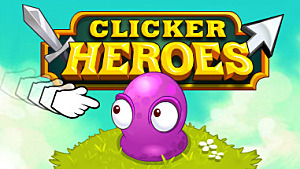 Clicker Heroes has been a phenomenon of a game, in fact it’s the 7th most popular free to play game on Steam. It was released on May 2015 and is also now available for iOS and Android. All players need to do, is click on things until they die. That is all. So, what has captured the imagination of gamers? 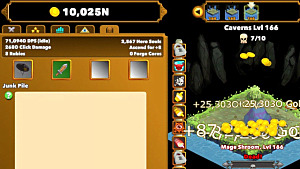 The interface is split down the middle, one side featuring information and the other side has monsters. Keep clicking on the monster to chip down their health until they die. Monsters never attack; they just take the players blows. 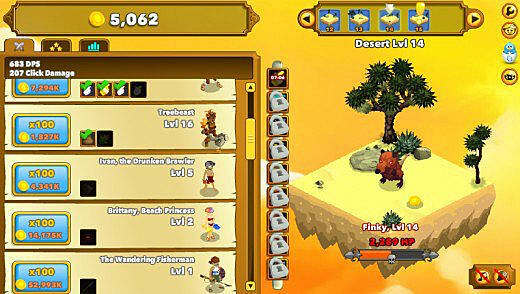 A defeated monster generates in-game currency which can be used to buy items. Players can purchase new heroes, or upgrades existing heroes so they can do more damage. The more heroes in a player’s inventory, equates to more damage per click. Although clicking just makes monsters die quicker, enemies do just passively take damage. Clicker Heroes is very much an idle clicker game. The game encourages both active and passive play, sitting there clicking away, or letting the game play whilst you’re inactive. 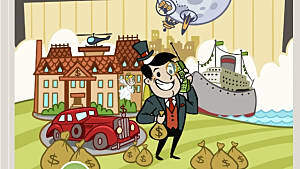 The game requires constant clicking, whilst also waiting for upgrades, so it does have aspects of idle clicker games, such as Tuber Simulator and The Simpsons Tapped Out. 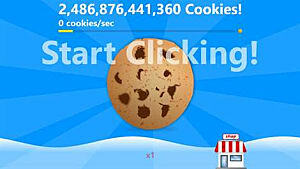 So, as we can all imagine it’s addictive, but has much more game play than other clicker games. 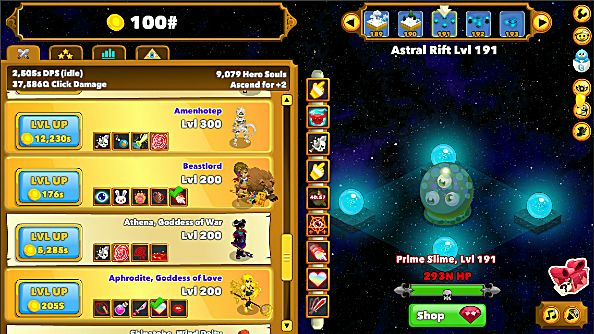 The game eases players in gently, with only a small number of clicks needed to begin with to kill monsters and then players are rewarded with in-game currency. 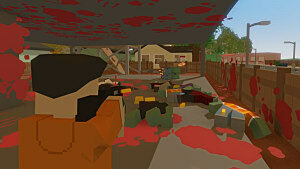 Then another monster appears and that’s killed too, along with several others. With this in-game currency, players can afford to level up their characters to increase how much damage can be doled out per click, or they can save up for a pricier hero who can dish out damage automatically. It is this levelling up process that maintains the player’s feeling of power, as they strive to defeat higher level monsters with their increasingly powerful clicks. The additional abilities include: increasing damage by 100% or perform 10 clicks automatically. These are timed for 30 seconds and need to be recharged. Activate all abilities simultaneously, once the game has been farmed for gold, to ensure beating bosses are as easy as possible. Each gaming area requires 10 monster kills to unlock the next level. Each new area needs to be physically selected to proceed, or monsters will continually spawn. Bosses are on timers and need to be killed quickly, therefore requiring rapid tapping. If players fail, they start over again with the last level they completed to acquire higher damage output. It could be said that the game style of slaying monsters and levelling up has appealed to those who enjoy DPS games and maybe, just maybe a slight RPG parody, mixed with the fundamental concepts of Cookie Cutter. Like most MMO’s the game is endless. Once a player has purchased all the heroes, but is then faced with a level they cannot complete, they can use the ‘ascend’ ability to start all over again. 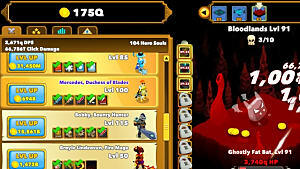 For this, the player can collect ‘hero souls’ that summon ancients, to obtain special bonuses like increased damage whilst idle, or a higher percentage of gold dropped. 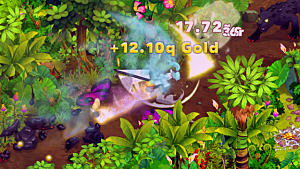 Ascend multiple times and players can collect more gold, more damage and proceed further into the game. 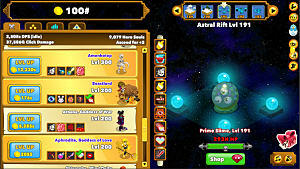 Players can purchase special characters, called ancients that have far-reaching passive abilities. Here's more information about ancients and hero souls, from Game Skinny. Once players have ascended, there is total replayability. Yes, the same levels have to be repeated, but players are better equipped to deal with them, in a fraction of the original time. 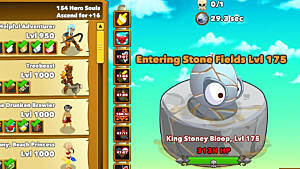 The game takes aspects of stereotypical idle clicker games and combined them with RPG elements and it does create a truly unique and addictive game. It is much, much more than an idle clicker game, offering replayability too. The game is free to play and available on Steam, iOS and Android. 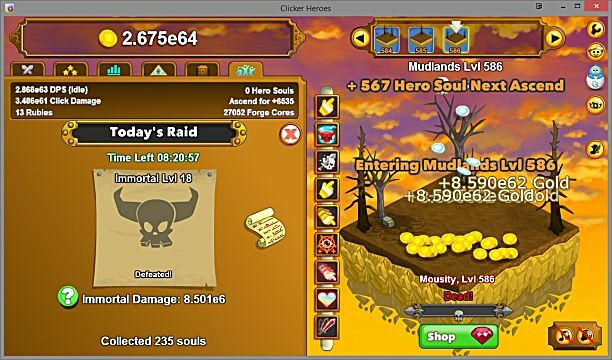 Clicker Heroes 2 Stat Guide: What Do They Do? What's Best?